Free & thorough inspection of the roof for storm damage and roof hail damage. The inspection covers roof shingles, gutters, skylights, flashing, vent hoods, vent stacks, chimney caps & chimneys. Following a severe storm, your first roofing concern is whether or not the storm caused any leakage that might damage your home’s interior. Even if your roof does survive a hail storm without leaking, there may still be significant hail damage. That’s why it’s important to call in an experienced roofing expert like LeafGuard by Midlands Home Solutions to check your roof for hail damage. We will thoroughly inspect your entire roof and look for any signs of roof hail damage. Our expert roofers have the experience to be able to suggest the appropriate roofing services, whether it's a roof repair or roofing replacement. 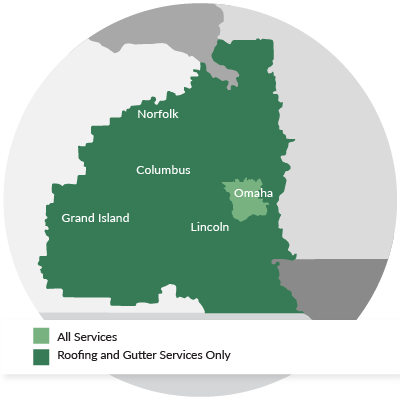 After a storm, we're the experts to call in Council Bluffs, Lincoln, Omaha, and nearby! The high winds that often accompany hail storms can cause blow-off damage that should be repaired right away. Hail-damaged roof shingles may not cause a problem for months or years, but it’s wise to call LeafGuard by Midlands Home Solutions as soon as possible to see if the damage merits roof repair or roofing replacement. We provide free inspections and estimates for hail damage repair in Sioux City, Bellevue, Grand Island, Kearney, Fremont, Hastings, La Vista, and surrounding areas throughout Eastern Nebraska & Western Iowa. Give us a call or get an online quote today! No matter what Mother Nature throws your way, LeafGuard by Midlands Home Solutions's roofing services can provide peace of mind and help protect your home against the elements.